Drinking coffee is the first thing you do every morning. It’s what keeps you alert during an intense work schedule. So, doesn’t it make sense that the cornerstone of your day should be as perfect as it can be? You could order your daily shot/s from the local barista and make that a part of your routine. Or, you can take charge and buy your own coffee maker – saving money and maintaining top-notch quality every time. But, buying the best coffee maker with a grinder isn’t as easy as ordering a cup of coffee. You have to consider your budget, choose what features you need the most, and compare products to get the best deal out there. This is difficult without guidance. Fortunately, that’s what we have to offer. We have a lot to share with you about units that grind and brew coffee. To go about this in an organized way, we have arranged this guide into two sections. In the first section, our top 5 coffee makers with grinders, we will introduce you to the most notable products in this segment through our reviews of the top 5 coffee makers with grinders. In the next section, we will discuss the factors you must consider when buying one. By the time you have read both sections, you will have gained the knowledge to make your choice confidently and be happy with your purchase. 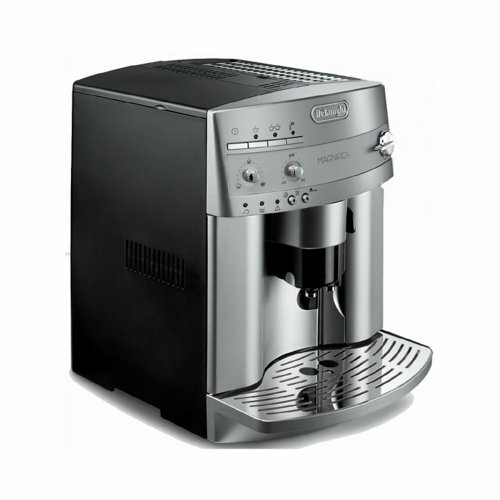 The Magnifica ESAM 3300 is a top-tier espresso and cappuccino maker. It is highly regarded among coffee lovers. The 3300 brings together many user-friendly and utilitarian features for novice and expert brewers. Even though the Magnifica is expensive, it offers great value. If you’re a big-budget buyer, this is the best coffee maker with a grinder you can get. In our assessment, this product shines for three main reasons. First, the graduations on the dials and the icons over the buttons make operating the ESAM 3300 easy and intuitive. Next, the 13 burr-grinder settings allow you to adjust the coarseness of the grind to your taste. Lastly, the spout produces steam for making lattes and cappuccinos and hot water for tea or hot chocolate. 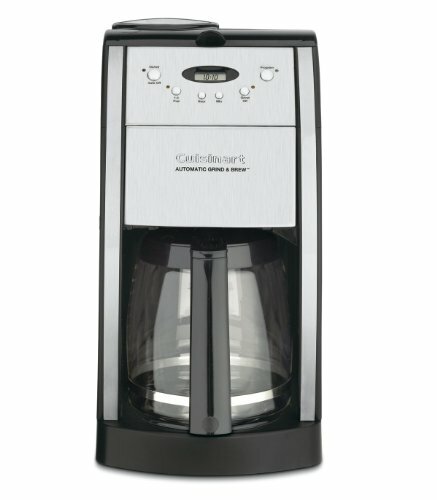 In addition to the top three features, this coffee maker is easy to clean and maintain. It also comes with a 2-year limited warranty. Perhaps, the only negative comment people have is that the grinder is noisy. This may be a problem if you use the coffee maker in a noise-sensitive environment but it comes with the territory. Considering the Magnifica 3300’s features, including its popularity among coffee buffs, and its pricing, ambitious home-baristas will find it to be the perfect machine. But, if you’re the casual “espresso only” type of person, you will find that this product over-delivers. The Breville Grind Control costs only half as much as the Magnifica ESAM 3300. However, the Breville machine does not have a steam spout for frothing milk. So, no cappuccinos and lattes. But, if you are an exclusive espresso drinker, I recommend you take advantage of the massive price difference. The Grind Control’s on-board burr-grinder system offers exceptional performance and control. The machine has six grind settings and eight strength settings. You can calibrate the strength settings whenever you switch grind settings or the variety of coffee beans. Also, the LCD screen provides real-time information on everything from water level to brewing time. Another feature that I love is the auto-start function. This feature automatically starts grinding and brewing coffee at a preset time. When you time it right, you can wake up to the aroma of freshly brewed coffee every day. Isn’t that awesome? But, the factory gold tone filter makes murky coffee. So, you might want to buy good quality paper filters for superior results. In summary, people who love experimenting with different types of coffee beans and brew strengths, the Breville Grind Control is an exciting option to pursue. However, if you’re not particular about the nitty gritty of brewing, but still want to enjoy the taste of freshly ground coffee, there are other options to consider. 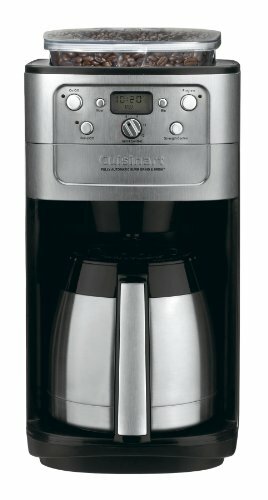 The Cuisinart DGB-900BC is an economical coffee maker that doesn’t make a heavy compromise on features for the price. This machine comes with a burr grinder. However, the machine does not offer control over the texture of the grind. But, you don’t have to weigh the grinds manually because the machine will select the quantity based on the number of cups. The machine also provides three settings for choosing the strength: strong, medium, or mild. And, if you don’t want to use the grinder, you can turn it off and use pre-ground coffee. The 2-4 cups function optimizes extraction for small amounts of coffee. The DGB-900BC includes a Gold Tone permanent filter, a charcoal water filter, and a dual-wall carafe. Although cheaper models from Cuisinart include some of the above features, they don’t include all these features. For instance, the DGB-625BC and the DGB-550BK come with blade grinders and not burr grinders. However, the 900BC has a couple of issues. Firstly, it’s hard to pour coffee when the carafe is running low because of the lid’s design. Secondly, coffee grinds overflow when brewing a full pot. The machine is also a little difficult to clean and maintain. But, getting a burr grinder at this price is a huge plus point. And, that alone makes this machine worth the price. Not everyone who loves coffee is a virtuoso brewer. But, we all know freshly ground beans make better coffee than pre-ground beans do. If you’re shopping for the best coffee maker with a grinder for the money, give the DGB-625BC a thought. Although it lacks some convenience and control features, this coffee maker gets all the basics right. For a coffee maker and grinder combo costing less than $100, this model is well built. It has a charcoal paper filter for purifying the water, a blade grinder for breaking up coffee beans, a 12-cup carafe for collecting the brew, and a hot-plate for keeping the coffee warm. Also, you can program the machine to brew coffee at a selected time. So, when you wake up, a fresh pot is ready to jump start your day. Another admirable aspect is the 3-year limited warranty. But, the machine has a few downsides. For instance, you must measure the pods with the scoop before brewing. Unlike high-end coffee makers, this one cannot automatically select the amount of beans to grind according to the required strength. Also, the 12-cup carafe holds only 7.5 customary cups. Overall, if you have high expectations from a coffee machine, the DGB-625BC will let you down. However, if you are a casual coffee drinker, this coffee brewer is all you need. The Cuisinart DGB-550BK is stylistically different from the DGB-625BC. External appearances aside, the two machines are nearly identical. Both machines cost less than $100 and come with a 3-year limited warranty. However, the 550BK occupies more space than the 625BC does. Like the 625BC, the 550BK is an entry-level coffee maker with grinder. The blade grinding system isn’t as good as burr grinding systems. Despite the lack of uniformity in the size of ground beans, the taste is superior to coffee made from pre-ground beans. But, you must measure the amount of coffee beans manually to vary the strength. The 550BK has an auto-start timer that you can set 24 hours in advance. You can select to brew between 1 to 12 cups of 5 ounces each. The standard US cup measures 8 ounces. As long as you keep that in mind when measuring water and beans, you will be fine. After use, you can program the machine to shut down immediately or after a selected time interval. This way, you can keep the pot warm if you’re not drinking it all in one go. The two models give you the option to use pre-ground coffee as well. All you need to do is press the “Grind Off” button. All things considered, the machine’s capabilities will limit expert brewers significantly. But, for people who are in it just for the freshness of instantly-ground coffee, the 550BK is a viable option. You make many purchase decisions every day. Some require little to no thinking. Buying a coffee maker with a grinder does not fit that description. In fact, this process requires the skill to identify indicators that separate the best from the mediocre. 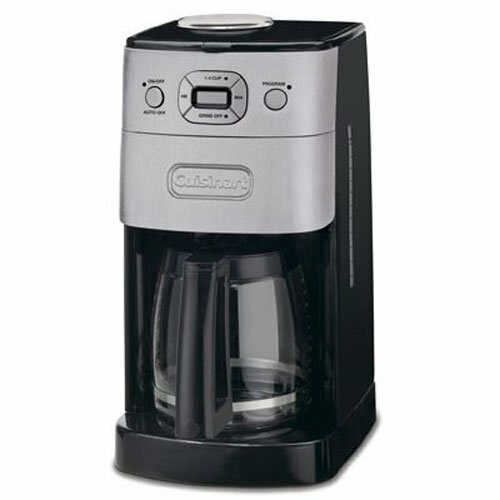 In this section, we will discuss all the factors you must consider when buying a coffee maker with a grinder. But before that, we will talk briefly about the benefits of the product. Then, at the end, we will point you to some notable brands in this space. So, let’s get started. Why should I get a coffee maker with a grinder? There are two ways of looking at this. First, why buy a coffee maker with a grinder as opposed to without one? Second, why not buy a coffee maker and a grinder separately?. We will address both situations. Of course, you could buy a coffee grinder separately. But, that just means more counter space, maintenance, time, and effort. Coffee makers with built-in grinders are fast, convenient, and compact. Select Grind Quality: You can choose to grind your coffee to the desired level of fineness or coarseness. Make Your Blend: You can mix various types of beans in different ratios to create your own blend rather than rely on packaged coffee. Monitor Quality: Since you have full control over what goes in, you don’t have to worry about contaminants or adulterants. Save Money: In the long run, a coffee maker with a grinder will help you save money without sacrificing taste. Whether you’re a die-hard coffee lover or a casual coffee consumer, coffee makers with grinders will make a world of difference. But, no single product is ideal for everyone. To select the best product for your needs, you must weigh features and benefits against the cost. So, let’s talk about that next. What are the factors I must consider when buying a coffee maker with a grinder? Grinder Type: Low-cost units have blade grinders. As you go up the price spectrum, burr grinders replace blade grinders. Burr grinders produce coffee granules of the same size. Blade grinders produce granules of uneven size. 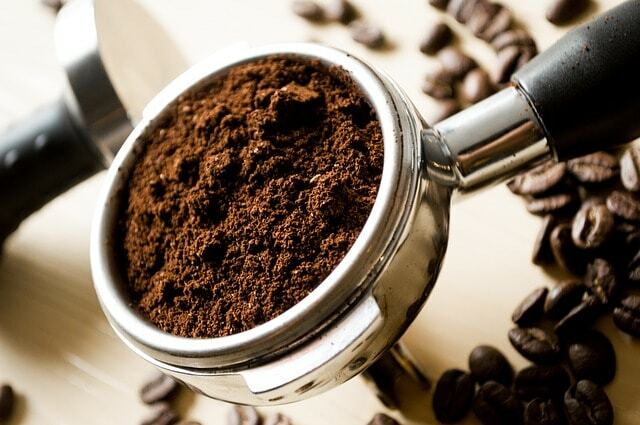 For this reason, burr grinders bring more flavor and consistency to the brew. If flavor matters more to you than money, opt for a burr grinder. Serves: A good product must accommodate single serve cups as well as multiple serve carafes. The machine must also be compatible with cups of different sizes. If So, look for how well the machine works in both modes. Also, look for measurements in ounces rather than cups because a cup is a non-standard unit of capacity. If you’re looking for single serve coffee maker, we’ve also written a guide on single serve coffee makers. Grind Setting: After grinding, the granules must resemble the consistency of beach sand. If the machine has only one setting, you can achieve this consistency with certain types of pods only. If you like to mix and match different varieties of pods, it’s a smart idea to go with a product that has multiple grinder settings. Strength Setting: When manually brewing coffee, you can change the strength by adding more coffee. Some machines allow you to do this automatically. So, you don’t have to waste time messing around with scoops, spoons, or weighing scales to get a consistent brew every time. Water Level Setting: In machines without water level setting, you must carefully measure the amount of water per serving. Machines that have this capability do this without your involvement. Again, it’s a matter of convenience and consistency. Filter: The factory filter that comes with the machine may not perform well. For this reason, you may have to use paper filters. Coffee makers that allow you to switch between the permanent filter and paper filter, or use them together, produce clear brews. Are there any other factors I must bear in mind? Counter Space: Before you buy a coffee maker, you must identify a place for it. The location must have enough floor area and top clearance to use the machine properly. It must also have a convenient power outlet. Auto-Start: This is an extremely useful feature. This facility starts grinding and brewing coffee at a preselected time. So, you can set the coffee machine to go the previous night and wake up in the morning to a fresh cup or pot of coffee. Hot Plate: The hot plate keeps your carafe warm as you go through your day. Though this consumes power, it keeps your coffee fresh. But, if the plate is too hot, it can overheat the coffee and destroy the flavor. This feature is important for people who brew an entire pot in one go but finish it gradually. Grind-Off: You don’t want your coffee machine to become inoperable when you run out of pods. Having the option to turn the grinder off and use pre-ground coffee is a handy backup option. Warranty: Since the machine has moving parts and involves liquids, there are chances of malfunctions and leaks. So, make sure your machine comes with a good warranty cover. Apart from these features, subjective considerations, such as aesthetics and budget, also influence purchase decisions. But, leave these considerations for the end. Ah, I understand now. So, what are my options? If you’re shopping for a product in the budget segment, Cuisinart offers a good range of affordable coffee makers with grinders. 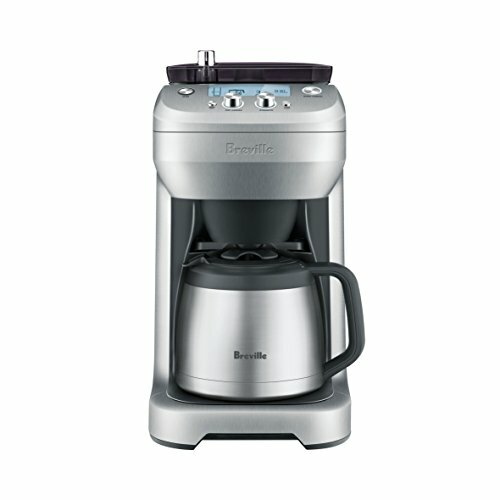 If you’re on a high-budget, look at products from Breville and DeLonghi. The expensive products often go on sale. So, browse around the Internet for the best price. But, if you’re not interested in the research, don’t worry. We have done the heavy lifting for you. You can refer out the list of top 5 coffee makers with grinders and choose a product from there. It’s the fastest and easiest way. Before concluding the article, let’s do a round-up of the information in the reviews of coffee makers with grinders. While the DeLonghi ESAM 3300 offers a milk frother, its coffee grinding system is comparable to that of the Breville Grind Control. If you’re strictly an espresso drinker, you can ditch the frother for a significant cost saving. We’ve also written some popular buying guides for espresso machines specifically that we recommend you check out. However, if you’re looking for an entry-level coffee maker that gets the job done, choose a machine from the Cuisinart line-up. But, remember, a low-cost coffee maker is more of a time saver than anything else. If you’re a coffee connoisseur or aspire to be one, then save some money for a high-end machine because you will regret settling for a low-budget machine. Although the coffee maker is not a new invention, its present form is relatively new. What was once a specialty equipment has now become a home appliance. Its rise in popularity has led to many innovations and developments. Consequently, there are many good quality products at different price ranges. This is a little confusing, but with the right information and guidance, you will get brewing in no time. Hopefully, this guide will help you do so. Which espresso machine with a built-in grinder is our favorite? Find out here!